Devin Devorris Hester Sr. (born November 4, 1982) is a former American football wide receiver and return specialist. He was drafted by the Chicago Bears in the second round of the 2006 NFL Draft. He played college football at Miami, where he was the first player in the university's recent history to play in all three phases of American football: offense, defense and special teams. In addition to Chicago, Hester also played for the Atlanta Falcons, Baltimore Ravens and Seattle Seahawks over his eleven-season NFL career. Originally drafted as a cornerback, Hester quickly made an impact as a kick returner, and later became a wide receiver. He holds the NFL record for most all-time return touchdowns (punt and kickoff combined) and most all-time punt return touchdowns. He is widely regarded as one of the best return specialists in NFL history, and was the first person ever to return the opening kick of the Super Bowl back for a touchdown. During his youth, Hester enjoyed following the Dallas Cowboys. He especially idolized Deion Sanders, Emmitt Smith, and Michael Irvin. He was also a fan of the Chicago Bulls during the Michael Jordan and Phil Jackson era. Fred Taylor of the University of Florida was Hester's favorite athlete. In addition to football, he also enjoyed playing soccer and following baseball. Hester attended first Palm Beach Gardens High, then on to Suncoast High School, where he played football as a cornerback, wide receiver, return specialist, and running back. He earned recognition from SuperPrep.com as the top high school prospect in Florida and Parade, who named Hester onto their All-American team. Hester also participated in the 2002 CaliFlorida Bowl, where he returned a kick for an 80-yard touchdown. His success prompted his teammates to nickname him "Sugar Foot." Considered a five-star recruit by Rivals.com, Hester was listed as the second best cornerback in the nation in 2002. Hester was also a standout track athlete. While at Suncoast, he received All-America accolades, and he ranked second nationally in the long jump as a junior. He also captured the 2004 Big EAST Indoor long jump title as a member of the University of Miami track and field team, with a leap of 7.37 meters. He also competed in the 60 meters and 100 meters, posting personal bests of 6.77 seconds and 10.62, 10.42W seconds, respectively. After completing high school, Hester enrolled at the University of Miami, where he played for the Miami Hurricanes football team from 2003 to 2005. As a sophomore in 2004, he earned national recognition as a kick returner after being named a first-team All-American by the Walter Camp Football Foundation and The Sporting News. His ability to thrust laterally and break away from pursuers made him one of the nation's most dangerous return specialists. During his freshman year, Hester returned an opening kick for a 98-yard touchdown against the Florida Gators. In a game against Duke in 2005, Hester broke six tackles while returning an 81-yard punt. Ultimately, Hester completed his college career with a total of six touchdowns from kick returns, including one blocked field goal return. He also scored one rushing and receiving touchdown and recorded five interceptions as a defensive back. Hester became the first football player in the Miami Hurricanes' recent history to play as member of the special, offensive, and defensive teams. He was known as "Hurricane Hester" by his fans and teammates. During his productive tenure at the University of Miami, Hester befriended Deion Sanders through Ed Reed, an alumnus of the University of Miami, and friend of Sanders. Sanders counseled, advised, and encouraged Hester. Hester was also known as "Anytime" in college, which is a tribute to Sanders' nickname, "Prime Time". He also adopted Sanders' signature touchdown dance, and showboating maneuvers, which he carried to his future NFL career. Hester began his professional career in the National Football League with the Chicago Bears, who selected him in the second round of the 2006 NFL Draft with the 57th overall pick. The team originally drafted Hester as a cornerback, but they intended to play him as a return specialist, following the retirement of Jerry Azumah, and departure of Bobby Wade. The team's decision to draft Hester was initially criticized by fans and sports analysts, who believed the Bears should have spent their early picks on offensive prospects. In his first thirteen weeks as a professional football player, Hester recorded six return touchdowns, including a punt return in his NFL debut, and a then-record tying 108-yard touchdown from a missed field goal against the New York Giants. He also returned a punt for a clutch 83-yard game-winning touchdown against the Arizona Cardinals to give the Bears the lead in a comeback win, and two kickoff returns in one game against the St. Louis Rams. Following his record-breaking game during Week 14, opposing teams exercised additional caution when allowing Hester to return kicks. During the postseason Hester ran back a punt at a critical moment against the Seattle Seahawks, but it was called back on a blocking penalty. Regardless, the Bears won both NFC playoffs rounds, and advanced to Super Bowl XLI to play the Indianapolis Colts. He started the game on a high note for the Bears by returning the game's opening kick for a touchdown. The feat was the first touchdown return of an opening kickoff in Super Bowl history. It also marked the quickest touchdown scored in Super Bowl history as well as the quickest lead ever taken by any team, though the latter record has since been surpassed by the Seahawks in Super Bowl XLVIII. Following the kick, the Colts did not kick the ball directly to Hester, significantly limiting the Bears’ return efforts. Hester's feats in 2006 earned him three NFC Special Teams Player of the Week Awards and a trip to the 2007 Pro Bowl. After the 2006 season ended, he was named the NFC Player of the Month for December and was a finalist for 2006 Pepsi NFL Rookie of the Year. He was also voted onto the Associated Press’s 2006 All-Pro team with 48 and a half votes, finishing fourth behind LaDainian Tomlinson, Champ Bailey, and Jason Taylor who all received 50 votes. He finished the 2006 season by accumulating three touchdowns for 600 yards on 47 punt returns, and two touchdowns for 528 yards on 20 kick returns, thus making him one of the league’s most productive kick and punt returners. Even without taking an offensive snap prior to Week 14, Hester was the Bears' second leading scorer, behind kicker Robbie Gould. On a negative note, Hester struggled to control the football at times, having games with multiple fumbles on at least two separate occasions. Many fans speculated that Hester’s speed and prior experience as a wide receiver would earn him a spot on the Bears' offense, similar to teammate Rashied Davis. While Lovie Smith dismissed the speculation, he played Hester as a wide receiver for one play against the Tampa Bay Buccaneers on December 17, 2006. Hester attributes his talent to his mentor, Deion Sanders, who Hester claims helped him perfect his return game. Sanders, a former cornerback and kick returner, compliments Hester after every productive performance. However, Sanders also berated Hester for taunting another player en route to his second touchdown return against the St. Louis Rams. His teammates and coaches have also praised Hester. After the 2006 season, he was voted to receive the team's Brian Piccolo Award, which is given to a player who possesses a good character and work ethic. Bears fans and the local media nicknamed Hester the "Windy City Flyer" during his first year in Chicago. Hester fields a punt during Special Teams practice at the Chicago Bears' 2007 Training Camp. Shortly after losing Super Bowl XLI, Hester and special teams coach Dave Toub spent a significant amount of time working on new return strategies and formations. Ultimately, Lovie Smith converted Hester into a wide receiver in order to increase the number of opportunities he would receive during a game. Hester, who originally played as a wide receiver at the University of Miami, was initially hesitant about making the switch to offense, as he wished to follow in the footsteps of Deion Sanders. However, the Bears’ coaching staff eventually persuaded Hester to make the transition over the summer. During the 2007 off-season, Hester won the Best Breakthrough Athlete ESPY Award. Although NFL rules generally require wide receivers to wear jersey numbers in the 10-19 and 80-89 range, players who later change positions are allowed to keep their previous number, as long as it is not within the 50-79 range for eligible receiver purposes. Hester was allowed to keep number 23, a number normally used for cornerbacks, since it sits outside the 50-79 range. Along with former Pittsburgh Steelers wide receiver Dwight Stone, who wore number 20 during his eight-year stint in Pittsburgh, Hester was one of two wide receivers to wear a 20s jersey number since the NFL adopted the current uniform numbering system in 1973. Hester returned his first touchdown of the season, a 73-yard punt return, against the Kansas City Chiefs during Week 2. He nearly recorded a second touchdown return, but the play was negated by a holding penalty. Hester established himself as a threat on offense, when he caught an 81-yard touchdown pass from Brian Griese against the Minnesota Vikings. He also returned a punt for an 89-yard touchdown, though the Bears lost the game. In the weeks to come, many opposing special teams began to kick the ball away from Hester, contributing to, according to Mike Pereira, a 132% increase in kickoffs that went out-of-bounds. Rod Marinelli, the head coach of the Detroit Lions, placed a strong emphasis on kicking the ball away from Hester, saying, "kick the ball into Lake Michigan and make sure it (sinks) to the bottom." Before the Bears’ Week 12 matchup against the Denver Broncos, Todd Sauerbrun infamously stated that he would kick the ball to Hester. Hester, who had not returned a kick for a touchdown in almost a month, responded by returning a punt and kickoff for touchdowns. Keith Olbermann, a commentator for NBC Sunday Night Football, awarded Sauerbrun with the dubious "Worst Person in the NFL Award" for kicking the ball to Hester and failing to tackle him. The two touchdowns gave Hester the most kick returns for touchdowns in the Bears’ franchise history. Hester concluded the season with a 64-yard punt return for a touchdown and a 55-yard touchdown reception against the New Orleans Saints. He was even given the opportunity to throw a pass on a variation of a wide receiver reverse, but he was sacked while motioning to Bernard Berrian. Hester finished the season with six kicks returned for touchdowns, which set a league record. He finished the season ranking fourth on the League's all-time combined kick return list, behind Brian Mitchell (13), Eric Metcalf (12), and Dante Hall (12). Additionally, he amassed 299 yards on twenty receptions as a receiver, though he was often used as a decoy. His play on offense received mixed commentary. While the Bears’ coaching staff believed Hester showed enough progress to become one of the team's top receivers in 2008, Hester was prone to making small errors, including running routes incorrectly or dropping catches. He drew a fifteen-yard facemask penalty while attempting to fend off a would-be tackler in a game against the Saints, and received a $5,000 fine. Nevertheless, Hester concluded the season with four Player of the Week Awards, giving him a franchise-high total of seven in his career, and an invitation to the 2008 Pro Bowl. Prior to the beginning of the 2008 season, Hester stated that he would not attend the Bears' summer camp unless the team offered him a new contract. He further voiced his displeasure with his current contract in a phone interview with the Chicago Tribune, commenting, "I can’t go out and play this year making $445,000. Come on, man." Adam Schefter believed that the Bears were puzzled over how Hester should be classified (as a wide receiver or a return specialist of such a star caliber), and be offered a contract accordingly. After receiving a $30,000 fine for not attending two days of training, Hester returned to the team's camp. The team later offered him a new four-year contract extension, worth over $40 million. Hester missed the third game of the season after tearing cartilage in his ribs during the previous week. He returned to the field in the team's Week 4 contest against the Philadelphia Eagles, where he caught his first touchdown of the season. Lovie Smith gave Hester his first starting job as a wide receiver the next week, in place of the injured Brandon Lloyd. Hester went on to catch five passes for 66 yards and one touchdown. In the following week, Hester totaled 87 yards on six receptions. After a Week 8 bye, Hester caught four passes for 42 yards and had an 11-yard run against the Detroit Lions. He eventually lost his kick return duties to Danieal Manning, but began receiving more playing time as a wide receiver. Between Week 12 and 15, Hester caught 17 passes for 250 yards and one touchdown. David Haugh of the Chicago Tribune regarded Hester as the team's "biggest threat in the passing game." He concluded the season by catching 51 passes for a team high 665 yards. Unlike his previous two seasons in the NFL, Hester did not record a single touchdown return and only averaged 6.2 yards per punt return. Lovie Smith commented on Hester at the end of the season by saying, "I know his returns dropped off a little bit this year, but his plate was full there for a while. We think we have a happy medium now for him as a punt returner and continuing to develop as a receiver." Hester was also selected to play in the 2009 Pro Bowl as a third alternate. After the acquisition of Jay Cutler, Hester took on the role as the de facto number-one wide receiver. In the first game of the season, Hester caught seven passes from Cutler for 90 yards, including a 36-yard touchdown reception. In the following weeks Hester began to develop a rapport with Cutler and amassed 634 receiving yards and three touchdowns through the first ten weeks of the season. He played the best game of the season on October 25, 2009 against the Cincinnati Bengals, catching eight passes for 101 yards and a touchdown. In a game against the St. Louis Rams during the thirteenth week of the season, Hester injured his calf and missed three starts. Hester returned to play in the Bears season finale against the Detroit Lions, catching three passes for 75 yards. Despite missing the three starts, Hester led the team with 757 receiving yards, and finished behind Greg Olsen in receptions. Hester built his reputation around his kick returning abilities, but his kickoff-returning duties decreased significantly following the 2007 season finale. He told the Chicago Tribune that he plans on spending the offseason honing his receiving and returning skills by strengthening in his legs, especially to fully recover from the calf injury he sustained earlier. During the off-season, Hester worked on his speed and conditioning by prioritizing running over weight training. Bears offensive coordinator, Mike Martz, gave Hester the opportunity to work with Isaac Bruce, who was part of Martz's "Greatest Show on Turf". Bruce advised Hester on route-running and basic wide receiver fundamentals. Hester appeared in three preseason games, where he recorded five receptions for 64-yards. On September 19, the regular season, Hester caught four passes for 77 yards and a one-handed catch for a touchdown against the Dallas Cowboys. The following week, Hester returned a punt for a 62-yard touchdown in a close game against the Green Bay Packers. This was his first touchdown return since the final week of the 2007 season against the New Orleans Saints. On October 17, Hester returned 2 punts for 93 yards and an 89-yard touchdown, in a 23–20 loss against the Seattle Seahawks. The touchdown tied the record for most combined kick and punt return touchdowns in a career with Brian Mitchell (13). In week 10 of the regular season, Hester caught 4 passes for 38 yards and a 19-yard touchdown against the Minnesota Vikings. Hester was given back his kick return duties, and returned 2 kicks for 100 yards including a run back of 68 yards. Hester also ran back 2 punts for 47 yards including a return of 42 yards. 2 weeks later, Hester caught 3 balls for 86 yards from Jay Cutler, and returned a kick 46 yards in a 31–26 win against the Philadelphia Eagles. On December 20 in a game against the Minnesota Vikings, Hester scored on a 15-yard touchdown pass from Jay Cutler. Later, Hester returned a Chris Kluwe punt 64 yards for a touchdown, which set the all-time NFL record for combined kickoff and punt returns for touchdown with 14, passing Brian Mitchell. It was the tenth punt return for touchdown of his career, tying Eric Metcalf's record for the most punt return touchdowns in a career. Hester finished the season with 40 receptions for 475 yards and 4 touchdowns. As a return specialist, he amassed 564 yards on punt returns, while averaging 17.1 yards per return and scored 3 touchdowns. 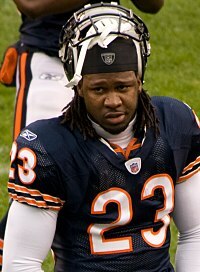 Hester was the third leading scorer, behind running back Matt Forte and kicker Robbie Gould. His accomplishments in the 2010 season earned him 2 NFC Special Teams Player of The Week Awards, a trip to the 2011 Pro Bowl, and a selection to the All-Pro Team. Hester was ranked 32nd best player in the League in a poll where active NFL players ranked their top 100 peers. Hester on December 25, 2011. On October 2, 2011, Hester became the NFL's all-time leader in punt return touchdowns with 11 when he returned a punt 69 yards for a touchdown against the Carolina Panthers surpassing Eric Metcalf's record. On October 16, Hester returned a kickoff for a 98-yard touchdown against the Minnesota Vikings. On November 13, Hester returned a punt 82 yards for a touchdown against the Detroit Lions. On April 30, 2012, Bears offensive coordinator Mike Tice and general manager Phil Emery announced that Hester's role would be reduced down to at least 4th-string, and Tice mentioned that the Bears would utilize Hester in a series of plays called the "Hester Package", instead of an every-down receiver. In the season, Hester caught 23 passes, a career low, while only catching one touchdown, which occurred in Week 4 against the Dallas Cowboys. He also failed to return a kick/punt for a touchdown, and ranked 22nd in punt return average during 2012. After Lovie Smith's firing on December 31, Hester stated that he considered retirement, though he tweeted that his consideration was not related to Smith. Hester exclusively saw playing time as a return specialist when Marc Trestman became the Bears’ head coach. In week two against the Minnesota Vikings, Hester broke the team record for most kickoff return yards in a game with 249. Four weeks later against the New York Giants, Hester passed Glyn Milburn for the most all-time kickoff return yards in franchise history with 4,643 yards. Against the Washington Redskins, Hester returned a punt 81 yards for a touchdown for his 19th career return touchdown, tying Deion Sanders' record. In addition to Hester's NFL records, he is also the leader in career punt returns (264) and punt return yards (3,241) among active players. Hester ended the 2013 season having averaged 27.7 kickoff return yards and 14.2 punt return yards, while also leading the league in kickoff return yards with 1,442. Hester became a free agent on March 11, 2014. He released a statement on March 5, 2014 that the Bears did not intend to re-sign him. Hester thanked the Bears organization and fan base for their support throughout his time in Chicago. Phil Emery, the Bears' general manager, commented on Hester's legacy, stating, "While Devin has redefined the pinnacle standard of the return position in the NFL, the memories and contributions he has given us cannot be measured by stats or numbers." Hester signed a three-year contract with the Atlanta Falcons on March 20, 2014. In his debut game with the Falcons, Hester caught five passes for 99 yards, helping lead the Falcons to a 37-34 Week 1 overtime victory over the New Orleans Saints. During Week 3, Hester brought back a 62-yard punt for his 20th career touchdown return, breaking the record for career non-offensive touchdowns he previously shared with Deion Sanders. Also in the same game, Hester recorded a rushing touchdown, forced fumble and fumble recovery. Hester was named the NFC's Special Teams Player of the Week for his accomplishments. Hester concluded the season with 504 receiving yards from 38 receptions and led the NFL with 1,128 kick-off return yards. He was also selected to play in the 2015 Pro Bowl. Hester missed a majority of the 2015 NFL season due to a turf toe injury. The Falcons activated him from the injury reserve for the final five games of the season, but only used Hester on special teams. He tallied 235 yards kick return yards and 34 punt return yards, but failed to record a touchdown. Hester underwent foot surgery in January 2016 to repair the toe injury he sustained earlier in the season. On July 26, Hester was released by the Falcons. Hester attributed his dismissal to the lingering toe-injury he sustained in the previous season. He voiced interest in continuing his career in the NFL for the 2016 season once he has fully recovered. On September 4, 2016, Hester agreed to a one-year deal with the Baltimore Ravens. Hester appeared in 12 games for the Ravens, where he was used exclusively on special teams. He recorded 180 punt return yards and 466 kick return yards but failed to return a touchdown during the 2016 season. The Ravens released Hester on December 13. Hester signed with the Seattle Seahawks on January 3, 2017. He debuted for the Seahawks in the first round of the 2016–17 playoffs against the Detroit Lions. Hester returned one kickoff for 20 yards and one punt for five yards against the Detroit Lions. During the Divisional Round, he returned five kickoffs for 194 yards, including 78- and 50-yard run backs against the Atlanta Falcons. The Falcons defeated the Seahawks, 36–20. Hester announced his intentions to retire from professional football after the game. On December 12, 2017 Hester officially announced his retirement from the NFL. The Chicago Bears honored both Hester and former teammate Matt Forte on April 23, 2018 during a press conference at Halas Hall. The two players signed ceremonially one-day contracts to retire as members of the Bears. Hester also returned a missed field goal 108 yards for a touchdown in a 2006 game against the New York Giants, and thus has 6 total TD for that season. Hester receiving a punt, December 25, 2011. Hester returned 33 punts for 564 yards. Hester returned 3 punts for 122 yards. Hester returned 4 kickoffs for 225 yards. Hester was in a relationship with Tamara James, a women's basketball player he met at the University of Miami. James played professionally for the Washington Mystics. Their engagement was later called off. Later, Hester married Zingha Walcott, an elementary school teacher, in 2010. They have two sons. Hester's family lives in Florida and was struck by Hurricane Wilma in 2005. Hester has assisted his family financially in helping them rebuild their home. His brother Lenorris, Jr., lived with Hester during his tenure with the Bears. Raised in a Christian household, Hester brings a Bible to every game he plays. Hester is also cousins with Aaron Hester who played for the Edmonton Eskimos of the Canadian Football League. Hester's successful rookie year drew him much publicity and popularity. Ever since his record-breaking performance against the Rams, Hester has been offered marketing opportunities from Nike, soft drink, and cell phone companies. There has also been a surge in the demand for Hester's jerseys within the Chicago area sporting stores. Also, Hester was invited to throw the ceremonial opening pitch and sing Take Me Out to the Ball Game at the Chicago Cubs' 2007 home opener. Along with teammates Rex Grossman and Tommie Harris, Hester appeared on the February 2007 issue of Sports Illustrated for Kids. His reputation has also been bolstered by EA Sports' Madden NFL 08, where Hester's perfect 100 speed rating made him the fastest player in the game's history. Hester also appeared in a promotional video for the game. He appeared in commercials for Under Armour in 2008 and 2009. In 2013, Hester outran a cheetah in a race sponsored by National Geographic at Busch Gardens Tampa. The competition consisted of Hester running back and forth on a straight track to simulate laps, while the cheetah ran in a similar but separate track. In 2013, Hester founded the Anytime 23 Empowerment Center Inc., a non-profit organization that serves as a positive, nurturing and safe environment for kids ages 6–18. The organization was later renamed to "Devin Hester Foundation". ^ Tom Pedulla (January 31, 2007). "Big returns on Bears' investment". USA Today. Retrieved April 29, 2007. ^ a b c "Q&A: Devin Hester". Chicago Tribune. Retrieved December 18, 2006. ^ a b Sports Illustrated, December 3, 2007 issue. ^ "PLAYER BIO - DEVIN HESTER". chicagobears.com. 2012. Archived from the original on August 31, 2012. Retrieved May 19, 2016. ^ a b All-Athletics, Profile of Devin Hester, Retrieved on Mary 19, 2016. ^ a b ChicagoBears.com, Free-agent splashes often leave NFL teams all wet Archived April 6, 2008, at the Wayback Machine, Retrieved on March 5, 2008. ^ ChicagoSports.com, Ask David Haugh, Retrieved on February 5, 2008. ^ Mayer, Larry (February 6, 2014). "What is quickest Super Bowl score?". Chicago Bears. Retrieved February 6, 2014. ^ ESPN.com, Hester can now strike fear in Bears. Retrieved on December 19, 2014. ^ ESPN.com, Bears to shake things up, move Hester to offense, Retrieved on May 15, 2007. ^ "The Best of the ESPYs". ESPN Internet Ventures. 2007. Retrieved July 20, 2007. ^ AtlantaFalcons.com, BEHIND THE JERSEY NUMBER: DEVIN HESTER (October 7, 2014), Retrieved on December 19, 2014. ^ a b ChicagoBears.com, Defense, Hester lead Bears to win Archived December 4, 2008, at the Wayback Machine, Retrieved on September 15, 2007. ^ Yahoo! Sports, Minnesota Vikings/Chicago Bears Box Score Sunday October 14, 2007, Retrieved on October 14, 2007. ^ Detroit Free Press, Lions face special threat in kick returner Devin Hester, Retrieved on January 7, 2008. ^ ChicagoBears.com, Sauerbrun says Broncos won't kick away from Hester Archived December 14, 2007, at the Wayback Machine, Retrieved on December 24, 2007. ^ Yahoo! Sports, Chicago 37, Denver 34, OT, Retrieved on December 24, 2007. ^ Rocky Mountain News, Collinsworth still one of the best, Retrieved on December 24, 2007. ^ Yahoo! Sports, Chicago 33, New Orleans 25, Retrieved on January 8, 2008. ^ ChicagoBears.com, Free agent-to-be Ayanbadejo focuses on his future Archived January 5, 2008, at the Wayback Machine, Retrieved on January 7, 2008. ^ RealFootball365, Hester sets NFL record with sixth return touchdown Archived January 3, 2008, at the Wayback Machine, Retrieved on January 7, 2008. ^ Chicago Sports Weekly, Making Sense of Devin Archived January 4, 2008, at the Wayback Machine, Retrieved on January 7, 2008. ^ NWI.com, Early returns say Hester a runaway winner, Retrieved on January 7, 2008. ^ ChicagoBears.com, Hester could be in mix for starting receiver spot in '08 Archived December 25, 2007, at the Wayback Machine, Retrieved on January 7, 2008. ^ The Chicago Tribune, Briggs, Berrian have suitors, Retrieved on January 7, 2008. ^ ChicagoBears.com, Hester wins fourth player of week award of season Archived January 5, 2008, at the Wayback Machine, Retrieved on January 7, 2008. ^ ChicagoBears.com, Bears surprised by Hester's absence from camp Archived July 25, 2008, at the Wayback Machine, Retrieved on July 23, 2008. ^ ChicagoBears.com, Hester ends two-day holdout, reports to training camp Archived March 24, 2012, at the Wayback Machine, Retrieved on July 25, 2008. ^ RotoWorld.com, "Archived copy". Archived from the original on November 15, 2010. Retrieved December 5, 2010. CS1 maint: Archived copy as title (link), Retrieved on December 4, 2010. ^ USA Today, Extent of Devin Hester's rib injury remains unclear, Retrieved on October 6, 2008. ^ ChicagoBears.com, Lloyd to miss Sunday's game in Detroit with knee injury Archived October 6, 2008, at the Wayback Machine, Retrieved on October 6, 2008. ^ Yahoo! Sports, NFL – Chicago Bears/Detroit Lions Box Score Sunday October 5, 2008, Retrieved on October 6, 2008. ^ DailyHerald.com, Manning the man on opening kickoff, Retrieved on December 15, 2008. ^ Yahoo! Sports, Devin Hester – Chicago Bears – NFL, Retrieved on December 15, 2008. ^ Chicago Tribune, 10 things to take away from the Bears' victory, Retrieved on December 15, 2008. ^ a b Pro-Football-Reference.com, 2008 Chicago Bears, Retrieved on January 7, 2009. ^ NFL.com, Devin Hester, Retrieved on January 7, 2009. ^ Mayer, Larry (January 7, 2008). "Bears confident Hester will take next step as wide receiver". chicagobears.com. Archived from the original on April 6, 2012. Retrieved January 7, 2009. ^ ChicagoBears.com, Veteran linebacker Briggs voted to fourth straight Pro Bowl Archived January 19, 2009, at the Wayback Machine, Retrieved on January 7, 2009. ^ ChicagoBears.com Does Hester have what it takes to be No. 1 receiver Archived October 26, 2009, at the Wayback Machine, Retrieved on November 15, 2009. ^ ChicagoBears.com Hester continuing to develop into all-around wide receiver Archived November 11, 2009, at the Wayback Machine, Retrieved on November 15, 2009. ^ Biggs, Brad (January 1, 2010). "Hester, Payne removed from injury report". chicagobreakingsports.com. Archived from the original on January 5, 2010. Retrieved January 2, 2010. ^ a b Lage, Larry (January 3, 2010). "Bears beat Lions 37–23 to finish disappointing 7–9". Yahoo! Sports. Associated Press. Retrieved January 4, 2010. ^ ESPN.com, Devin Hester Game Log – Chicago Bears – ESPN:, Retrieved on November 15, 2009. ^ McClure, Vaughn (January 3, 2010). "Devin Hester looks to regain return form". Chicago Tribune. Archived from the original on January 4, 2010. Retrieved January 4, 2010. ^ "August 1, 2011". Chicago Sun-Times. July 7, 2011. Retrieved August 3, 2012. ^ Hester Hailed By Peers in Top 100 Poll, June 13, 2011. ^ Marvez, Alex (March 22, 2011). "NFL moves up kickoff to 35-yard line". Fox Sports. Retrieved May 25, 2016. ^ Battista, Judy (December 5, 2011). "Stifling Returns Beyond Expectations". The New York Times. Retrieved May 25, 2016. ^ Smith, Michael (September 17, 2011). "Devin Hester on kickoff changes: "That rule is pointless"". Profootballtalk.com. NBC Sports. Retrieved May 25, 2016. ^ "Bears' Hester Returns Record 11th Punt for TD". ABC News. Associated Press. October 2, 2011. Retrieved October 2, 2011. ^ "Detroit Lions at Chicago Bears - November 13th, 2011". Pro-Football-Reference.com. Retrieved November 14, 2017. ^ "Bears ready to give up on Hester as every-down receiver". NFL.com. April 30, 2012. Retrieved August 3, 2012. ^ Mayer, Larry. "Hester: Retirement talk not related to Smith's firing". Chicago Bears. ^ Sessler, Marc (March 20, 2013). "Devin Hester no longer wide receiver for Chicago Bears". National Football League. Retrieved March 20, 2013. ^ Mayer, Larry (September 15, 2013). "Hester lifts Bears with record-breaking effort". Chicago Bears. Retrieved September 15, 2013. ^ Mayer, Larry (October 10, 2013). "Marshall lifts Bears over Giants with two TD receptions". Chicago Bears. Retrieved October 11, 2013. ^ Associated Press (October 20, 2013). "Hester ties NFL record with 19th TD". Fox Sports. Retrieved October 20, 2013. ^ Smith, Michael David (March 20, 2014). "Falcons sign Devin Hester". Profootballtalk.com. Retrieved March 20, 2014. ^ "New Orleans Saints vs. Atlanta Falcons". espn.com. September 8, 2014. Retrieved September 8, 2014. ^ Florio, Mike (September 18, 2014). "Devin Hester passes Deion Sanders for all-time TD return mark". profootballtalk.com. NBC Sports. Retrieved September 19, 2014. ^ AJC.com, Ryan, Hester honored as NFC players of week, Retrieved on September 27, 2014. ^ Jahns, Adam (July 26, 2016). "Falcons release former Bears returner Devin Hester". Chicago Sun-Times. Retrieved December 13, 2016. ^ Adams, Jay (December 23, 2014). "JONES, HESTER NAMED TO PRO BOWL ROSTER". Atlanta Falcons. Retrieved December 13, 2016. ^ "Falcons Place WR Hester on Short-Term IR". AtlantaFalcons.com. October 6, 2015. Retrieved October 8, 2015. ^ Smith, Michael (June 14, 2015). "Devin Hester unsure about his role in Falcons' offense". NBC Sports. Retrieved March 6, 2016. ^ "Falcons' Devin Hester: To begin rehab soon". CBS Sports. March 3, 2016. Retrieved March 6, 2016. ^ "FALCONS RELEASE WR DEVIN HESTER". AtlantaFalcons. July 7, 2016. Retrieved July 7, 2016. ^ McClure, Vaughn (July 30, 2016). "Devin Hester seeks full recovery before signing". ESPN. Retrieved July 31, 2016. ^ "Baltimore Ravens plan to sign Devin Hester". Retrieved September 4, 2016. ^ Bartelson, Jacob (December 13, 2016). "Baltimore Ravens cut KR Devin Hester". Pro Football Weekly. Archived from the original on January 5, 2017. Retrieved December 14, 2016. ^ Bergman, Jeremy (December 13, 2016). "Ravens waive former Bears legend Devin Hester". NFL.com. Retrieved December 14, 2016. ^ Bergman, Jeremy (January 3, 2017). "Seahawks sign veteran return man Devin Hester". NFL.com. Retrieved January 4, 2017. ^ a b c Cunningham, Michael (January 14, 2017). "Hester hurts Falcons in return". The Atlanta Journal-Constitution. Retrieved January 15, 2017. ^ Smith, Michael (January 15, 2017). "Devin Hester plans to retire". NBC Sports. Retrieved January 15, 2017. ^ Mayer, Larry (April 23, 2018). "Hester, Forte officially retire as Bears". Chicago Bears. chicagobears.com. Retrieved April 24, 2018. ^ a b c d Mayer, Larry (April 22, 2018). "Devin Hester's career By the Numbers". Chicago Bears. chicagobears.com. Archived from the original on April 23, 2018. Retrieved April 23, 2018. ^ a b c Rodkin, Dennis (April 2, 2014). "Devin Hester makes poor return on Riverwoods house sale". Crain's Chicago Business. Retrieved September 28, 2014. ^ "Aaron Hester, Devin's cousin, ready to make his own name in the NFL". suntimes.com. Archived from the original on April 30, 2013. Retrieved April 25, 2013. ^ David Haugh (December 14, 2006). "Devin-Mania is gaining speed". Chicago Tribune. pp. 1, 4. ^ CBS SportsLine.com, First Wrigley outing for Piniella, Soriano ends with defeat, Retrieved on October 8, 2007. ^ Lefton, Terry (July 16, 2008). "Under Armour inks endorsement deal with NFL's Devin Hester". Baltimore Business Journal. Retrieved November 15, 2009. ^ Scwartz, Nick (November 30, 2013). "National Geographic's 'Man vs. Cheetah' pits NFL's Devin Hester, Chris Johnson against cat". Daily News. Retrieved November 30, 2013. ^ Anytime23Empowerment.com, Anytime 23 Empowerment Center Inc. Archived August 26, 2014, at the Wayback Machine Retrieved on August 21, 2014. ^ "Devin Hester Foundation Hosts Youth Football Camp". Boys & Girls Clubs of America. July 17, 2015. Retrieved December 14, 2016. Wikimedia Commons has media related to Devin Hester.